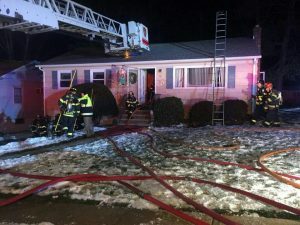 At approximately 17:38 hours, the Oakland Fire Department was toned out for a report of heavy smoke in the area of Yawpo Ave. and a possible house fire. Tower Ladder 241 and a Franklin Lakes engine were assigned on the initial auto-mutual aid dispatch due to the reported fire. Oakland Chief 1030 arrived on scene and reported heavy smoke and a confirmed working basement fire. At that time a second alarm was transmitted, bringing in Rescue 242 as a FAST team. Truck 241 arrived on scene and went to work assisting Oakland in opening up to check for possible fire extension while the Rescue stood by as a FAST team. Soon thereafter the fire was knocked down and placed under control, and units were released from the scene. Fortunately no one was home at the time of the fire, and no injuries were reported. Great job by the Oakland Fire Dept. and all the mutual aid companies who participated!